Close to Salzberg the newly refurbished in 2010 the Werfenerhof is owned and managed by the fourth generation of the Rettenbacher family. There are 27 very comfortable rooms, a wellness area with sauna and infrared cabin, lift, 2 disabled rooms a bar and a cozy lounge and dining room. There is a large meeting room that can be set aside for evening entertainment or just to be able to get the group together to check that everyone has remembered their gloves! This is an ideal location for those groups looking for a single occupancy hotel. 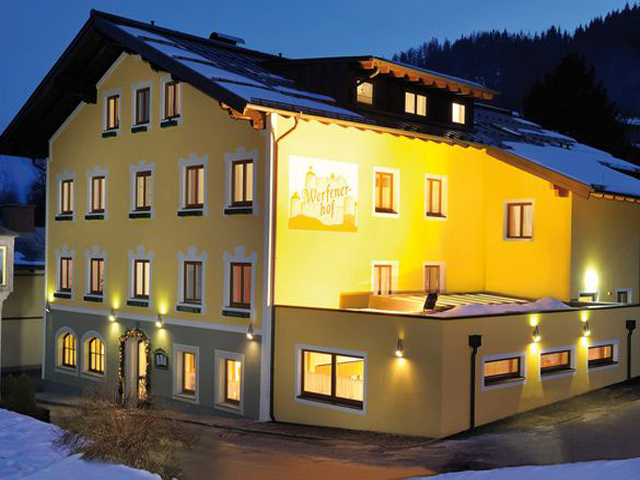 Werfen has its own ski area comprising 9 lifts and 25km of pistes, but for those groups looking for a larger area it is only a short coach journey to the closest portal of the Ski Amade region, Flachau.